The Bangalore Aquarium is the second largest aquarium in the country and is home to a variety of exotic and cultivable fishes. Located in Cubbon Park, it was established in the year 1983. The variety of marine species on display here includes the Siamese Fighters, Red Tail Shark, Goldfish and a wide variety of other fishes as well. The aquarium is a three storied, octagonal-shaped building. On the first floor of the building there are more than a dozen big tanks, where the larger fishes are displayed. The second floor, on the other hand has tanks which provide close observation of multi-colored fish species. The third floor houses the most interesting species which include some exotic fishes. 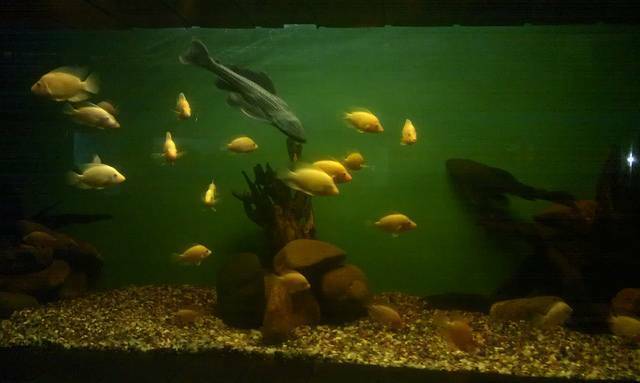 The aquarium is managed by the Karnataka Government's Department of Fisheries.